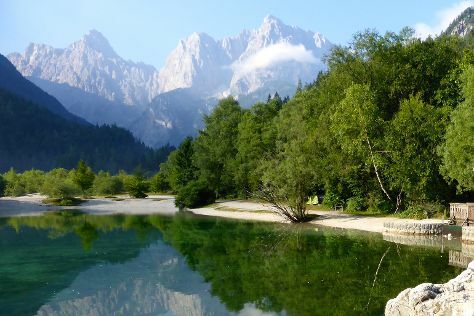 Escape the urban bustle at Lake Jasna and Vintgar Gorge (Soteska Vintgar). You'll discover tucked-away gems like Atelje Skulj - Pottery Studio and Galerija Fotografija. You'll find plenty of places to visit near Ljubljana: Bled (Lake Bled & Bled Castle (Blejski Grad)) and Radovljica Old Town (in Radovljica). Dedicate the 9th (Sun) to wine at some of the top wineries in the area. Next up on the itinerary: take a stroll through Ljubljana Old Town, take in the spiritual surroundings of Franciscan Church (Franciskanska cerkev), take in the views from Dragon Bridge (Zmajski Most), and have fun and explore at House of Experiments - Hisa eksperimentov. To find where to stay, ratings, traveler tips, and tourist information, refer to the Ljubljana vacation tool . Jakarta, Indonesia to Ljubljana is an approximately 20-hour combination of bus and flight. You can also do a combination of bus, flight, and shuttle. You'll gain 6 hours traveling from Jakarta to Ljubljana due to the time zone difference. Traveling from Jakarta in December, things will get cooler in Ljubljana: highs are around 5°C and lows about -3°C. Finish your sightseeing early on the 10th (Mon) to allow enough time to drive to Koper. Koper is a city in southwestern Slovenia, with the other Slovenian coastal towns Ankaran, Izola, Piran, and Portorož, situated along the country's 47-kilometre coastline, in the Istrian Region, approximately five kilometres from its border with Italy. Kick off your visit on the 11th (Tue): take in the architecture and atmosphere at Koper Cathedral and Bell Tower, kick back and relax at Svetilnik Beach, and then take in the architecture and atmosphere at Hrastovlje Church of the Holy Trinity. On your second day here, admire the landmark architecture of Praetorian Palace, stop by Nika's Tiny House, take in the spiritual surroundings of Church of St. George, then enjoy the sand and surf at Portoroz Beach, then examine the collection at Sergej Masera Maritime Museum (Pomorski muzej), and finally explore the engaging exhibits at Magical World of Shells Museum. To see where to stay, ratings, more things to do, and more tourist information, refer to the Koper route builder website . You can drive from Ljubljana to Koper in 1.5 hours. Other options are to take a bus; or take a train. Traveling from Ljubljana in December, expect Koper to be somewhat warmer, temps between 13°C and 3°C. Finish your sightseeing early on the 12th (Wed) so you can drive to Kobarid. Kobarid is a settlement in Slovenia, the administrative centre of the Municipality of Kobarid.Kobarid is known for the 1917 Battle of Caporetto, where the Italian retreat was documented by Ernest Hemingway in his novel A Farewell to Arms. Start off your visit on the 13th (Thu): don't miss a visit to Denkmal Am Predilpass, take in the dramatic scenery at Kozjak Waterfalls, then see the interesting displays at Kobarid Museum (Kobariski muzej), and finally take in the dramatic natural features at Tolmin Gorge. To see photos, traveler tips, ratings, and tourist information, go to the Kobarid route planner. Traveling by car from Koper to Kobarid takes 2 hours. Alternatively, you can do a combination of bus, train, and car; or do a combination of bus and car. Plan for slightly colder temperatures traveling from Koper in December, with highs in Kobarid at 3°C and lows at -3°C. Finish up your sightseeing early on the 13th (Thu) so you can travel back home.